Coined as “your wedding BFF” this account shares everything from beautiful engagement photos to floral inspiration. …The best part? They tag all of the vendors in the photos, so you won’t have to do any digging to find their information. BHLDN (which is actually Anthropologie’s sister company) is your source for vintage-inspired, beautifully crafted attire and decorations. Beware: their dresses are to-die-for and once you take a look, you might just fall in love with your dream dress. This is your ultimate source for all things wedding related. From bridal hair to honeymoon destinations, this account has got you covered! If you could put all of the wedding blogs you follow into one place, this would be it. Who doesn’t want to open up their Instagram app to photos of beautifully curated floral arrangements? 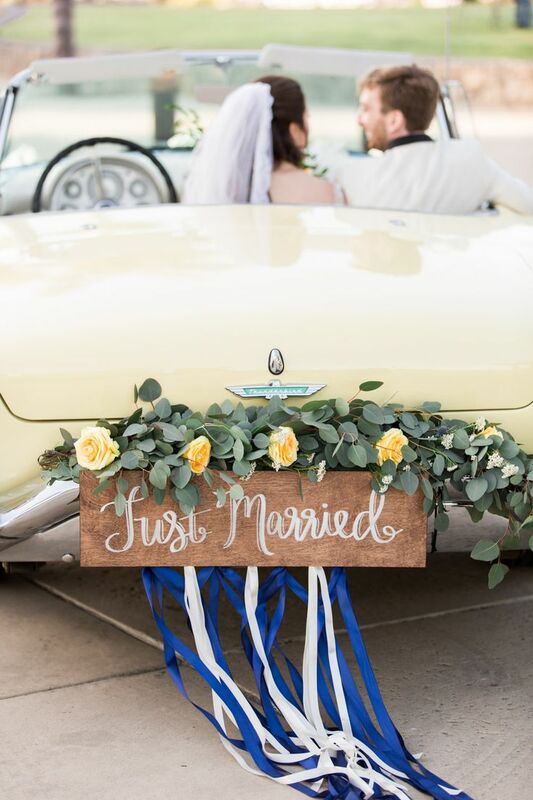 This account has been featured on top wedding sites like The Knot and Brides, so you know they have to be doing something right. Our favorite part about this account is that they give you a behind-the-scenes look at their work, and you know we’re suckers for a good #BTS pic! This is a must-follow for all the boho brides out there. The founder of Stone Fox bride, Molly Guy, started this anti-bridezilla showroom in NYC and it morphed into a site for girls that are tired of seeing princess gowns and mermaid silhouettes. With a motto of “f*ck weddings,” their site and their Instagram is dedicated to those who like their wedding inspiration photos with a side of sass. If boho-bridal isn’t your style, the engagement stories they post will either have you laughing or in tears (or both)! We couldn’t create this list without adding in a wedding cake account. The one thing we know your guests are going to look forward to is of course the cake. Before you start making tasting appointments, be sure to follow this account for inspiration. Chances are you’re already following this all-in-one account, but just in case we had to add it to our list. The Knot eats, sleeps and breathes weddings, and if you’re looking for inspiration this account has got it all. Plus, we know it’s every girl’s dream to have their engagement ring featured here, so be sure to polish those nails and tag them in your best ring shot! We might be biased, but we’ve got a pretty good thing going on over on our ‘gram too. Follow us to stay up to date with our latest products, blog posts, and inspiration photos! Our thoughts and prayers go out to everyone affected by Hurricane Harvey. The Salvation Army and American Red Cross currently are taking donations to help with hurricane relief efforts. The Coastal Bend Disaster Recovery Group is also seeking donations to help those hit the hardest in the coastal region. Please bring donations INSIDE do not leave items outside. Want to do more to help? Check out these amazing charities to find out more ways to help those affected by Hurricane Harvey. You Caring – Compassionate Crowdfunding organized by JJ Watt, a defensive end for the Houston Texans. Samaritan’s Purse – Two Samaritan’s Purse disaster relief units are now in Texas to help residents as they continue to struggle with rain, flooding, and destruction caused by Hurricane Harvey. Charity Navigator – Charity Navigator has compiled a list of highly-rated charities responding in the wake of the Hurricane Harvey devastation. Our list includes both national and local organizations that are providing food, shelter, and medical support. Setting a proper dinner table is always one of those adulting tasks that seem far more daunting than it actually is. While you might be stressing out wondering if you need to buy all new china, or where exactly the soup spoons should go, no need to worry. With a few key serving pieces in your arsenal and our setting instructions, you’ll be prepared to host a dinner party in no time! The first step in setting a proper table is having the right china. China is often the centerpiece of your wedding registry, so if you’re married or engaged, you’re likely familiar with adding these pieces to your registry. When it comes to china, you’re either talking about formal or causal dinnerware dishes. Formal or fine china includes bone china and porcelain, whereas casual china is usually earthenware or stoneware and is a less expensive option. Many sources will tell you that couples should buy two sets, one set of formal and one set of casual for everyday use. This really depends on your plans. If you plan on hosting formal dinner parties often, it’s a good idea to invest in some high quality china, whereas if you tend to lean on the more casual side of things and plan on only having friends over for a small gathering every once and awhile, there’s no need to invest in formal china. Place settings usually come in four- or five- piece sets. The four-piece is usually a casual china set and includes a dinner plate, salad/dessert plate, soup/cereal bowl, and mug. The five-piece set, typically for formal china, includes a dinner plate, salad/dessert plate, bread plate, and a cup and saucer. Some additional serving items you might want to consider are a large and small platter, two to three serving bowls of various sizes, a gravy boat, a cream pitcher and sugar bowl, a teapot, some small serving dishes of various sizes and shapes, soup bowls, and chargers. You’ll also want to make sure you have the appropriate water and wine glasses, as well as flatware to go with your set. When it comes to actually setting the table, the dinner plate is positioned in the center of the place setting, with the napkin placed over it. The napkin can actually be placed anywhere in an informal setting, either on the plate, to the left of the plate under the forks, or on its own to the left of the forks. The flatware is arranged around the plate in the order it will be used. Two forks are places to the left of the plate with the small fork on the outside and the dinner fork on the inside. The dinner fork (the larger of the two) is used for the main course, whereas the small fork is used for a salad or appetizer. The dinner knife is placed to the right of the plate, the cutting edge facing inward. Spoons then go to the right of the knife, again following the outwards-in rule by which is used first. If soup is served first, it would be placed outside the dinner knife and the dessert spoon would go to the left of the soup soon. Any drink glasses or stemware should be placed to the right of the setting, above the knife. For a formal event such as a dinner party or holiday meal, your formal place setting is just the informal place setting taken to the next level. You can decorate the table with floral centerpieces, candles, etc. This is your chance to have fun with it! A few things to remember: no more than 3 of any utensils are to be placed on the table at a time, except when an oyster fork is used in addition to the other three forks. If you are serving more than 3 courses before dessert, the utensils for the fourth are brought in with the food. Dessert spoons and forks are brought in on the desert plate before dinner is served as well as the cup and saucer for coffee and tea. Overall, the setting follows the same outside-in order as the informal setting did above. The glasses follow this same order, and the water glass should remain on the table from the beginning to the end, typically placed closest to the plates. The only additional differences are the salad plate atop the dinner plate, the place card addition, and the bread plate and butter knife.